The recent warm temperatures and bright sunny days have resulted in an explosion of blooms throughout the gardens. There are new surprises to delight with each passing day and in some instances with each passing hour. 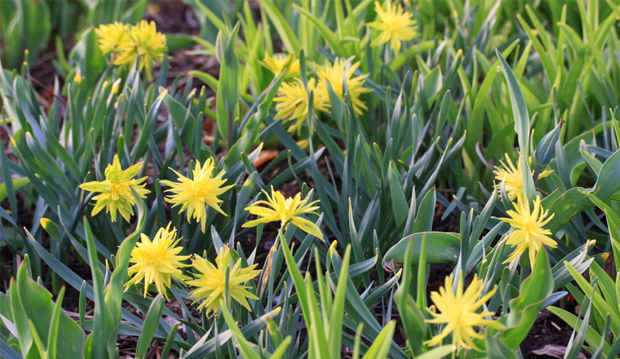 One of the spring blooming bulbs that is always sure to put a smile on my face is Narcissus ‘Rip Van Winkle’. The star-shaped blossoms held on this relatively short plant (six to eight inches tall), seen here, add a delightful touch to the Entry Garden Walk. These narcissi have been tucked in and planted between actively growing clumps of other perennials such as Hemerocallis and the extremely long blooming Geranium ‘Rozanne’, both of which will begin to flower later in the growing season. Careful combinations such as these will help to ensure maximum interest and colour throughout the seasons. Growing spring bulbs between other perennials also helps to disguise the maturing foliage of the daffodils, which will eventually yellow and die back. As I write this entry, it occurs to me that this particular bulb may no longer be blooming when you visit. Worry not, there are many other spring flowering bulbs sending up their flowering buds. It will be no time before the masses of assorted Allium and Camassia will burst into bloom, bringing brilliant blues and purples into the border. Last week I had the pleasure of working out in the garden. One of my tasks was to cut back last year’s growth on the green roof of the Straw Bale Shed, which also. provided a unique vantage point for viewing the garden. While on the roof I overheard some of our many, dedicated garden volunteers working below comment on the number of bulbs growing throughout the property. We would not have been able to plant all of these bulbs, if it weren’t for these dedicated volunteers who faithfully come out in all types of weather. The garden simply would not be what it is without the help of our volunteers, who are known as KOGS (Keepers of the Garden). They work closely with our head gardener, Sandra Pella, and seasonal gardener Martha ,who carefully plan what is to be done each weekday. This week we had a number of special guests in the garden. Marjorie Harris was here to shoot a series of videos for her blog. Michael Richardson was in for two days to help shred brush piles that will soon be spread throughout the garden to return precious organic matter back the soil (and feed our precious soil microorganisms). There is a third guest who also deserves a special mention. Please see the image below. No, this image has not been photo shopped, and no, you are not seeing double. Sandra’s identical twin sister, Deborah, came in for a visit from Arizona and kindly offered some assistance in the garden. Each December Sandra heads to Arizona where she in turn volunteers at the Phoenix Botanical Garden. What a treat! 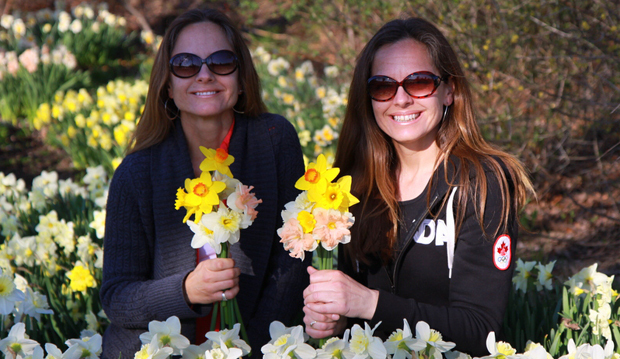 Can you see the difference between all the daffodils in bloom?